Beautifully engraved certificate from the Sutter Buttes Land Company issued in 1935. 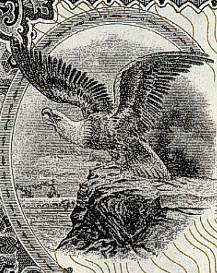 This historic document has an ornate border around it with a vignette of eagle standing on a rock. This item is hand signed by the Company's President ( J. V. Mendenhall ) and Secretary ( D. I. Cambell ) and is over 69 years old. The certificate was issued to San Francisco Attorney, Sidney H. Erhman. The Sutter Buttes, a unique cluster of volcanoes isolated in the midst of the Sacramento Valley, was the sacred "Middle Mountain" of the valley Indian tribes. The Indians that lived in and around the Sutter Buttes were the Southern Maidu or Nisenan. These Indians, like all American Indians, were descendants of the migratory peoples that crossed the Bering Straits from Asia and then spread southward into the North and South American continents. The Buttes that form such a prominent feature in the landscape of Sutter have been known by various names since they came to the knowledge of white men. They were spoken of by Fremont in 1843 as "The Three Buttes." In the grants made to Captain Sutter, they are called "los tres picos." Later they were called "Sutter's Buttes" and "Marysville Buttes," but are now generally spoken of as the "Sutter County Buttes." The County of Butte, which adjoins Sutter County on the north, received its name from these noted peaks, although at that time they were in Sutter County. In 1852, the boundary between these two counties was changed so as to include the Buttes in Butte County; but two years later they were restored, and have ever since been a part of Sutter County.